Teaming with Honolulu agency MVNP and Los Angeles-based production company Accomplice Media, First Hawaiian Bank has launched an ambitious branding campaign centering on people coping with life’s milestones. MVNP came up with concepts for a series of spots featuring ordinary people as they deal with all too familiar life events. To produce the spots, the agency turned to Accomplice Media and Director Stephen Pearson, a former agency creative who has directed character-driven ads for many well-known brands. Eight spots use humor emotional storytelling to elevate the bank’s brand imaging. Although it serves a state with a population of less than 1.5 million people, First Hawaiian Bank is intent on reaching its audience with the sophistication of an international financial powerhouse. Teaming with Honolulu agency MVNP and Los Angeles-based production company Accomplice Media, FHB has launched an ambitious branding campaign centering on people coping with life’s milestones. 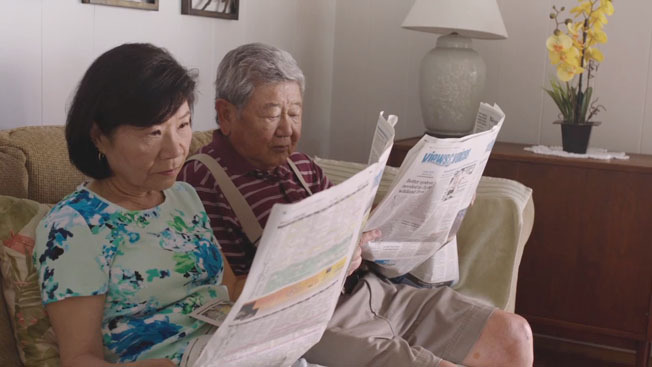 Rather than pushing specific retail services—as most regional banks do—these funny, beautifully-produced spots aim to forge an emotional connection with Hawaii residents from all walks of life. “We wanted to reinforce and reinvigorate our brand to the market,” says Christopher Dods, the bank’s Executive Vice President, Marketing and Communications. “Instead of talking about accounts and loans, we wanted to show that First Hawaiian Bank has been a member of the local community for a long time and underscore the many ways that we can help people throughout the course of their lives. Christopher Dods, Executive Vice President, Marketing and Communications Division; Susan Soken, Vice President, Marketing and Communications Division. Vince Soliven, Executive Creative Director; Jo Archibald, Senior Copywriter; Juju Ranches, Senior Art Director; Jenni Katinszky, Executive Broadcast Producer; Debbie Tada, Account Services Director; June Kaneshiro, Account Supervisor; Charlie Pedrina, Senior Graphic Designer; Louis Scheer, Junior Graphic Designer; Lori Kimura, Media Director; Elaine Kami, Associate Media Director. Stephen Pearson Director; Mel Gragido, Executive Producer; Benn Martenson, Director of Photography.